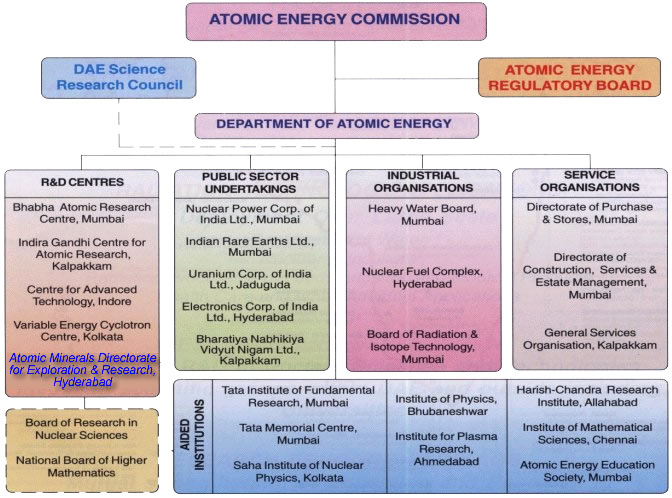 The Atomic Minerals Directorate for Exploration and Research (AMD) is one of the Research & Development units of the Department of Atomic Energy as shown here. The Directorate is headed by Director who is assisted by Additional Directors, Regional Directors, Head Groups, Chief Administrative and Accounts Officer and Joint Controller of Finance and Accounts. Western Region, Eastern Region, North Eastern Region, Airborne Survey & Remote Sensing Group, Atomic Minerals Data Centre, Material Management Group, Human Resource Development, Safety Unit, BARC-AMD Training School. Northern Region, Southern Region, Departmental Drilling Group, Contract Drilling Group, Instrumentation Group, Construction & Engineering Services Group, Public Awareness Programmes. Additional Director Operations-III K.Ramesh Kumar Central Region, South Central Region, Beach Sand & Off-shore Investigations Group, Mining Regulatory Group, Atomic Minerals Stockpile Accounting, Scientific & Technical Resource Centre. Additional Director (R&D) Sandeep Hamilton Exploration Geophysics Group, Rare Metal and Rare Earth Group, Physics Group, Chemistry Group, Mineralogy-Petrology-Geochemistry Group, Publication Group, Environment and Forest cell,Research and Development.